03. Etta James - W.O.M.A.N. A brand new compilation by Jonathan Fischer for his series of Black Radical Music for Trikont. Long before Elvis, many black Blues Gospel and Jazz artists had laid the cornerstone for the musical revolution that would shatter the western world - Rock'n'Roll. Much less known than their white imitators, nonetheless they produced the grittier originals - they combined the archaic drive of the Blues with Country melodies and the feverish beat of black Gospel, and pepped up African rhythms with electric amplification in order to please their audience's hunger for new thrills. 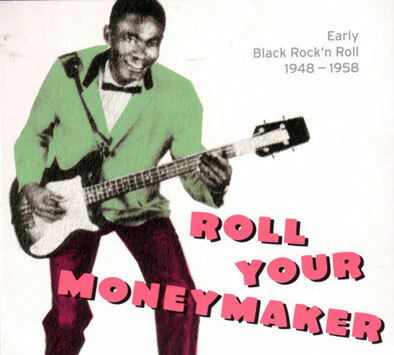 Besides well-known names like Chuck Berry, Howlin' Wolf or Bo Diddley, the compilation "Roll Your Moneymaker" also honours many unjustly overseen Rock'n Roll pioneers: from gospel singer Rosetta Tharpe to Johnny Guitar Watson, from Ike Turner's early rockabilly blueprints to the doo-wop-rock of Ruth Brown, alongside dazzling musicians as Magic Slim, Andre Williams, Big Maybelle, Rufus Thomas, Lazy Lester, Etta James and Jesse Stone. I bought this on vinyl today and it ROCKS !!!!!!!!!!!! !